Maa Durga represents Shakti, the power of the Supreme Being that preserves moral order and righteousness in the creation. She is also called Divine Mother, protects mankind from evil and misery by destroying evil forces such as selfishness, jealousy, prejudice, hatred, anger, and ego. Goddess Durga represents a united front of all Divine forces against the negative forces of evil and wickedness. She is the mother of the universe and believed to be the power behind the work of creation, preservation, and destruction of the world. Since time immemorial she has been worshipped as the supreme power of the Supreme Being and has been mentioned in many scriptures - Yajur Veda, Vajasaneyi Samhita and Taittareya Brahman. Also known as Parvati is the consort of Lord Shiva. It is said that the Goddess Shakti takes on different forms such as Kali, Chandi or Durga to fight the demons. She is the power behind all creation, preservation and destruction in the Universe. Literally translated, Durga means a fort that is difficult to overcome. 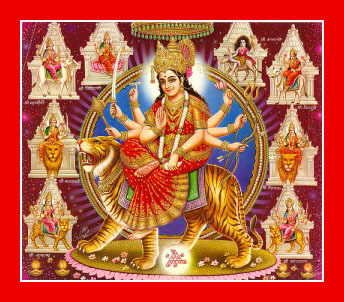 A more elaborate meaning of Durga is ‘du’-‘r’-‘ga’ or the destroyer of all evils and diseases. Shailaputri, Shailaputri, literally means the daughter of the mountains. Variously known as Sati Bhavani, Parvati or Hemavati, the daughter of Hemavana – the king of the Himalayas, she is the first among Navadurgas. The embodiment of the power of Brahma, Vishnu and Shiva, she rides a bull and carries a trident and a lotus in her two hands. Chandraghanta The third facet of Goddess Durga is Chandraghanta. She has a ‘chandra’ or half moon in her forehead in the shape of a ‘ghanta’ or bell. She is the apostle of bravery and possesses great strength to fight in the battle against demons. Kusumanda, Kushmanda is the fourth form of the mother goddess. She is considered the creator of the universe. The universe was no more than a void full of darkness, until her light spreads in all directions like rays from the sun. Skandamata, The fifth aspect of the Mother Durga is known as Skanda Mata – the mother of Skanda or Lord Kartikeya, who was chosen by gods as their commander in chief in the war against the demons. Skanda Mata has four arms and three eyes, holds the infant Skanda in her right upper arm and a lotus in her right hand which is slightly raised upwards. 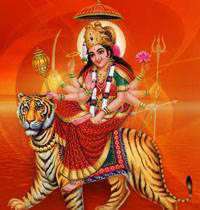 Katyayani, The sixth form of Mother Durga is known as Katyayani. According to legend, she is the daughter of a great sage called Kata, who wished to have a daughter in the form of a goddess. Katyayani was born to Kata as an avatar of Durga. Kaalratri, Kaal Ratri is the seventh form of Mother Durga. She has a dark complexion, disheveled hair and a fearless posture. She is black like Goddess Kali and holds a sparkling sword in her right hand battle all evil. Her gesture of protection assures us of freedom from fear and troubles. Maha Gauri, Maha Gauri is intelligent, peaceful and calm. She wears white clothes, has four arms, and rides on a bull. Siddhidatri. Siddhidatri is the ninth form of Goddess and has supernatural healing powers. She blesses all Gods, saints, yogis, tantrics and all devotees as a manifestation of the Mother Goddess. During these festivals Maa is invoked in different forms Durga, Lakshmi and Saraswati. Praying to the form of Durga destroys all evils and vices inside use, praying to the form Lakshmi is associated with the gain of spiritual wealth and divine qualities and calling upon the form of Saraswati gives the knowledge which liberates us from all evil and negativities. There are many incarnations of Durga: Kali, Bhagvati, Bhavani, Ambika, Lalita, Gauri, Kandalini, Java, Rajeswari. Durga incarnated as the united power of all divine beings, who offered her the required physical attributes and weapons to kill the demon "Mahishasur".